On the occasion of the Feast of the Immaculate Conception, pope Francesco has opened the Holy Door at the Basilica di San Pietro in Vaticano, thus celebrating the beginning of the extraordinary Jubilee of Mercy. 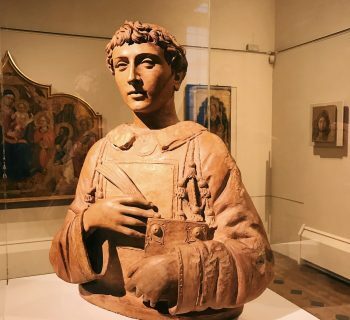 This is an inspiring occasion for pilgrims and travelers to experience a unique journey of spirituality in Rome. This morning around 11.00 am, after the Mass celebrated in piazza San Pietro and witnessed by about 50 thousand pilgrims, Pope Francesco has opened the Holy Door of Mercy, an entrance to the basilica di San Pietro in Vaticano, thus celebrating the official beginning of the extraordinary Jubilee of Mercy, in the presence of the pope emeritus Benedetto XVI. As the ones in the other papal basilicas in Rome, the Holy Door in San Pietro is usually walled-up and only opened on the occasion of the Jubilee. 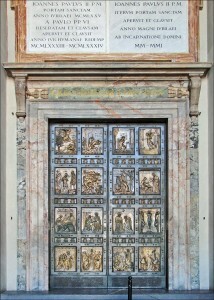 Holy Door at San Pietro (c) Jean-Pierre Dalbéra, via Wikimedia Commons. 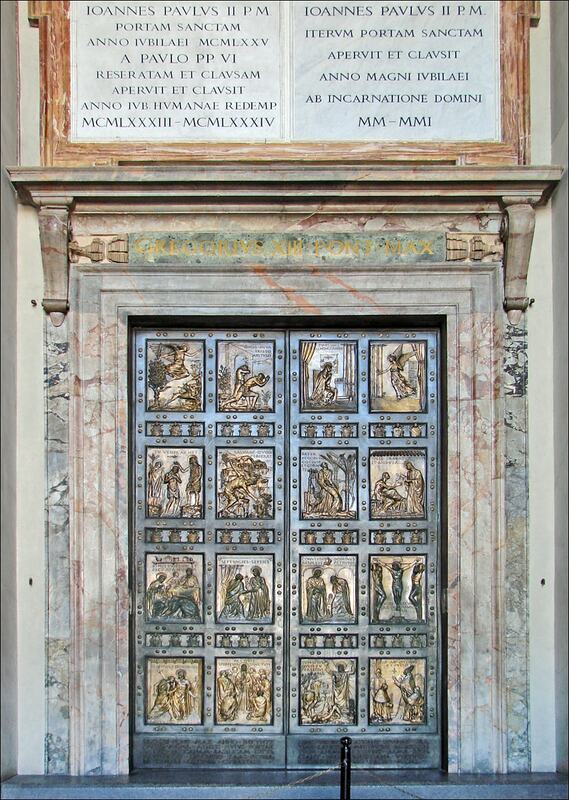 The Holy Door symbolizes the gift for any worshipper to access a special path towards the Christian salvation. Pilgrims who walk, after confessioning themselves, through any of the Holy Doors opened for this Jubilee, will receive the complete remission of all the sins and will be invited to the meditation on mercy to the neighbor especially in this particular period, when peace and respect among all the people in the world are most needed. Next 13th December, also the Holy Doors of the basilica di San Paolo fuori le Mura, San Giovanni in Laterano and the other cathedrals of the world will be opened. The worshippers who desire to attend one of the pedestrian paths reserved to the urban pilgrimage have to register their presence on the Jubilee official site. 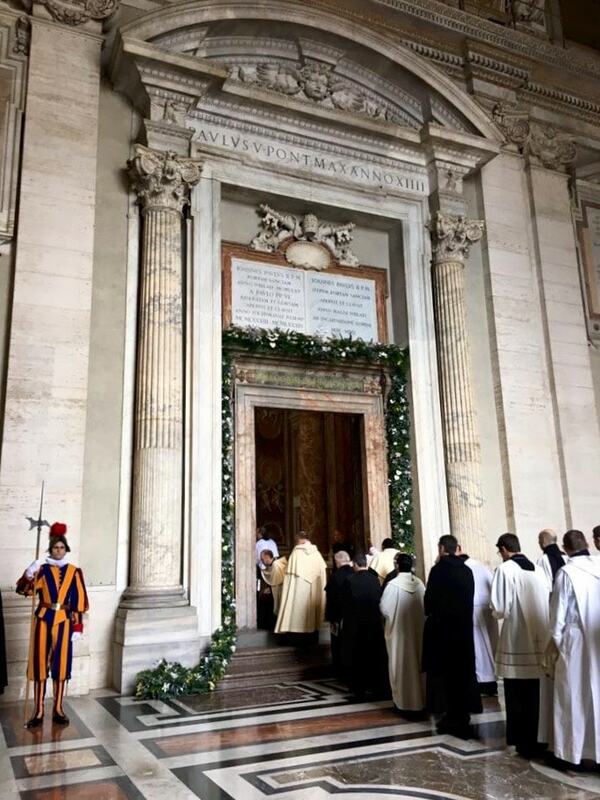 Opening of the Holy Door at San Pietro by pope Francesco on the occasion of the extraordinary 2015 Jubilee of Mercy, via Pontificio Consiglio per la Promozione della Nuova Evangelizzazione. 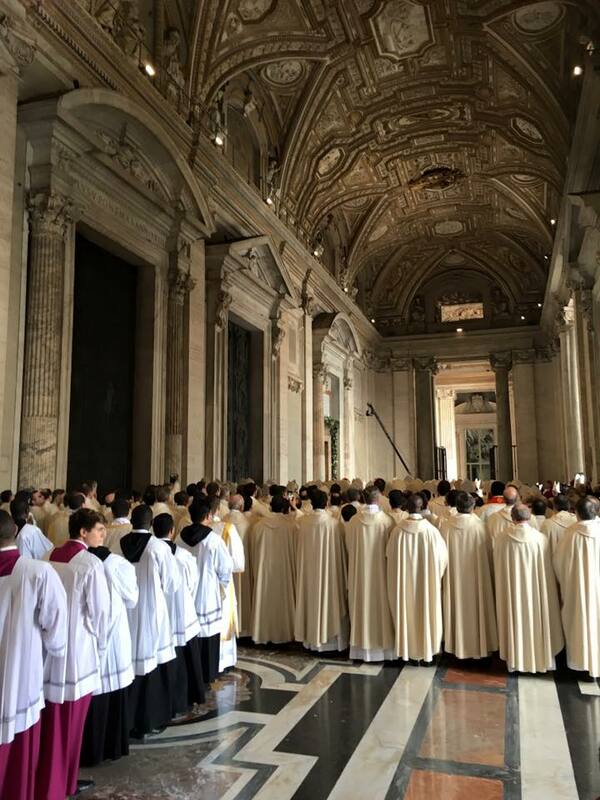 Opening of the Holy Door at San Pietro on the occasion of the extraordinary 2015 Jubilee of Mercy, via Pontificio Consiglio per la Promozione della Nuova Evangelizzazione. 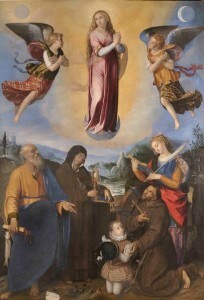 Scipione Pulzone, The Immaculate with angels, saints Andrea, Chiara, Francesco and Caterina d’Alessandria and Andrea Cesi, 1581, Ronciglione (Viterbo), San Francesco d’Assisi. 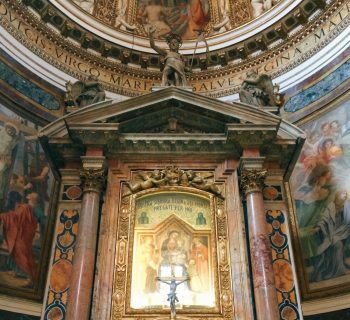 Originally destined to the chiesa di San Bonaventura al Quirinale, Rome. In the liturgical calendar of the Roman Catholic Church, the Feast of the Immaculate Conception celebrates the belief that the Virgin Mary was preserved from the original sin since her conception. The feast was first solemnized as a Holy Day of Obligation by Pope Clement XI, with the “Commissi Nobis Divinitus”, a papal bull dated to the 6th December 1708. The Immaculate Conception was later defined by pope Pio IX as a Roman Catholic dogma in the bull “Ineffabilis Deus”, dated to the 8th December 1854. It’s not by chance that pope Francesco has chosen the 8th December as the day to start the Holy Year. 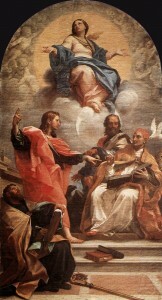 Carlo Maratta, The Immaculate Conception, 1689, Rome, basilica di Santa Maria del Popolo. As explained by pope Francesco during the Angelus, “The Immaculate Conception means that the Virgin Mary is the first saved by the infinite Mercy of God the Father, as early example of the salvation that God wants to donate to each man and woman, in Christ. For this, the Immaculate has become the sublime icon of the divine Mercy defeating the sin (“L’Immacolata Concezione significa che Maria è la prima salvata dall’infinita misericordia del Padre, quale primizia della salvezza che Dio vuole donare ad ogni uomo e donna, in Cristo. Per questo l’Immacolata è diventata icona sublime della misericordia divina che ha vinto sul peccato”) [Full text of the Angelus]. The solemnity of the Immaculate Conception proceeded today with the traditional celebration in piazza Mignanelli next to piazza di Spagna around 4.00 pm, where the pope has taken part to the homage of a wreath to the Madonna of the Colonna dell’Immacolata by the firemen of Rome. 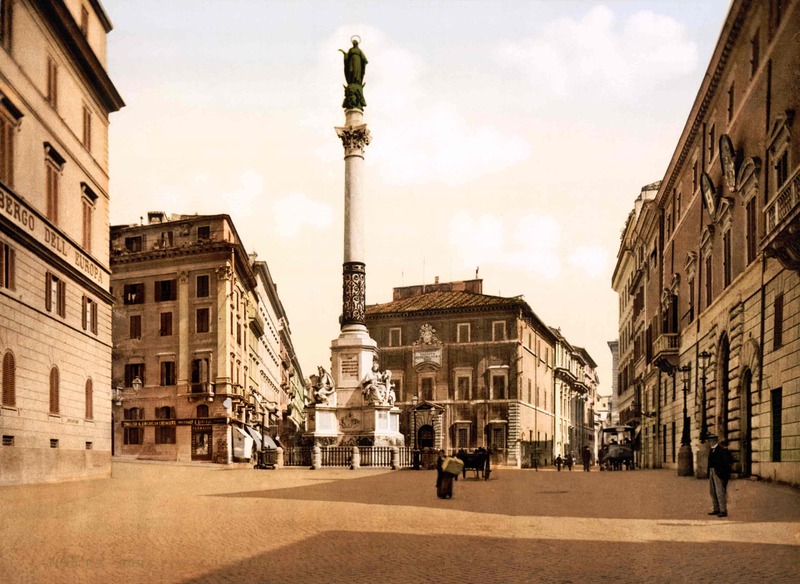 The monument dedicated to the Immaculate was conceived by the architect Luigi Poletti and inaugurated in 1857: the main statue of the Virgin Mary, sculpted by Giuseppe Obici, stands at the top of an ancient Roman column coming from the Campus Martius. Piazza Mignanelli, Rome, Italy, ca. 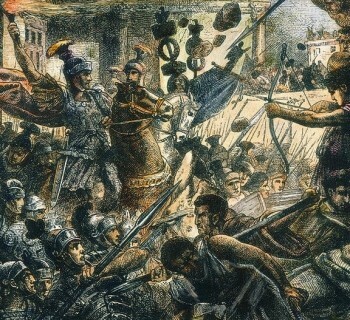 1895, from the Photochrom Prints Collection at the Library of Congress, Washington, D.C.
Icon of Salus Populi Romani, 6th century (? ), Rome, basilica di Santa Maria Maggiore, via Wikimedia Commons. Then around 5.00 pm, pope Francesco accomplished one of his frequent visits to the basilica di Santa Maria Maggiore where he addressed his prayers to the venerated Madonna called “Salus Populi Romani” (“salvation of the Roman people”) set up on the altar of the 17th century Paoline chapel. 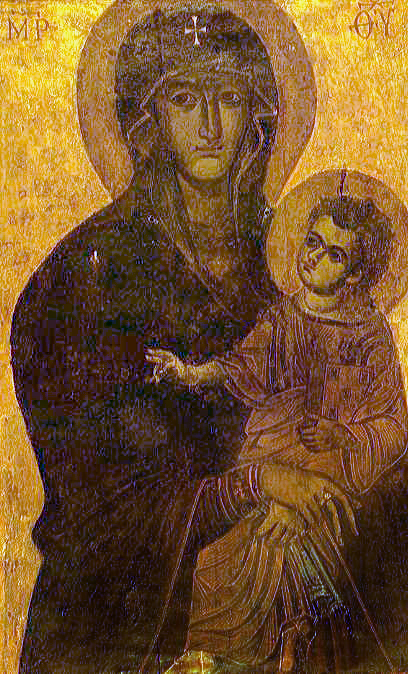 The pope is deeply devoted to this Early medieval icon of the Virgin Mary, traditionally attributed to Saint Luca and believed to be brought to Rome by Saint Elena, mother of the emperor Costantino.